My mother has a wonderful collection of ornaments, some dating back 40+ years. 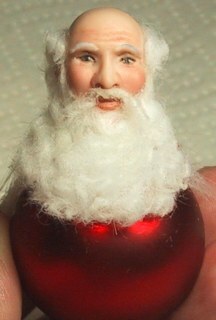 One of our family favorites came from Germany, and features a paper mache santa head on a large red glass ball. He has mohair beard, and rabbit fur trimmed velvet hat. This project is a miniature version of that ornament. This is a fast and easy holiday project. Why not make several for gifts?? Plan ahead for this project. Pour a suitable head for your santa, and cut off mid neck. 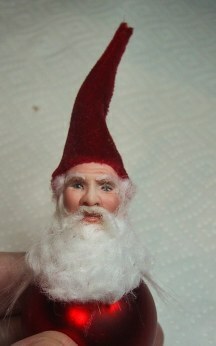 (This guy is Nicholas, my latest sculpture.) 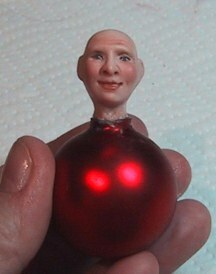 Clean the neck so that is approximately the same size as the neck of the ornament. After firing, it should be just small enough to slip inside the neck. Clean, fire and paint your head in the normal manner. If you need help with greenware preparation or china painting, there are tutorials on this site for both of those topics. Please use the link to the tutorial index at the bottom of this page. Hot glue your head to the top of a 35 mm glass ball. These come on stems in packages of 6 pieces at Michaels, and the cost is less than $2.00. They come in lots of great colors too! 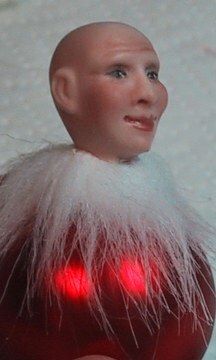 Cut a 1/4" wide strip of artificial fur and glue around the neck to cover where head and ornament were joined. 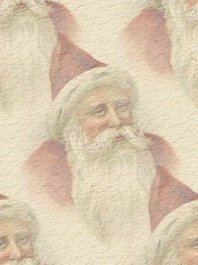 Using waved viscose, or precurled mohair, wig and beard your Santa. Measure around Santa's head. Cut a piece of velvet the width of head measurement, and 2 1/2" high. Fold fabric in half, and cut into a triangle shape, keeping the bottom edge equal to the head measurement. Bring the other two edge right sides together, and stitch or glue, forming a tall pointed hat. 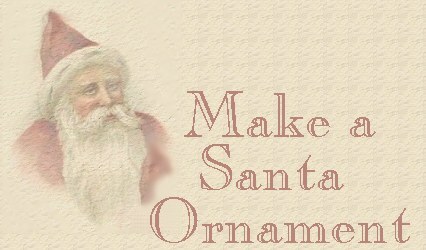 Place on Santa's head, and glue firmly into place. If necessary, use hot glue, but make sure that hat is securely attached. Cut a piece of fur 1/4" wide and long enough to go around lower edge of hat. Be sure to trim down the fur if necessary. Glue fur around bottom of hat, covering raw bottom edge. Add a small piece of fur to the tip of the cap. Fold hat over to one side and glue or sew into place. Attach a gold jewelry jump ring to the top center of the hat. 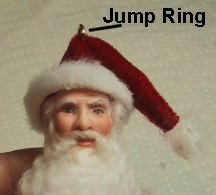 You can now slip an ornament hook thru the ring, and hang your santa on the tree. Now that you have the basic concept, think creatively. These little glass balls come in some beautiful colors. 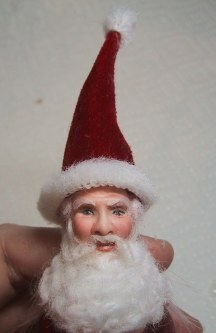 How about a Santa in a jewel-tone hat, with teal blue ornament, and antique gold metallic trims??? Or one in all winter whites with pearl trim??? 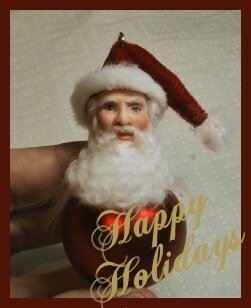 Enjoy making your own Santa ornaments, and be sure to send me a picture! Happy Holidays! and taking an interest in my online tutorials. to help you learn the basics of miniature doll making. as a tutorial of your own. or print it out and sell or distribute it as your own. If you would like to be notified when new tutorials are added to my site, please sign up for my mailing list using the form on my home page.